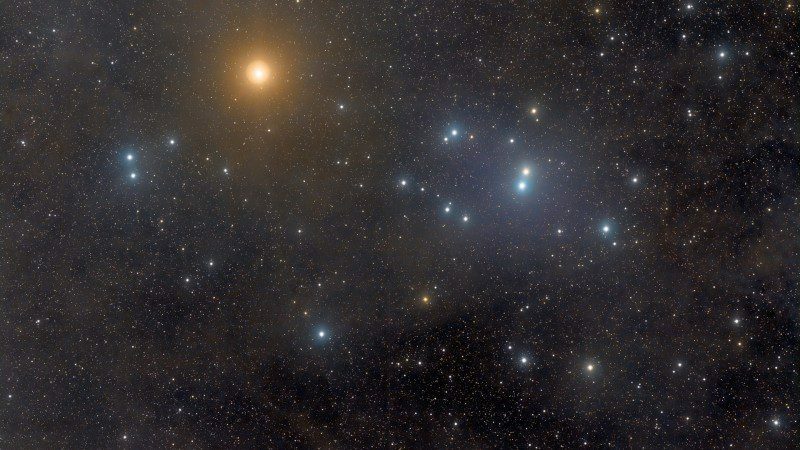 The Hyades star cluster is a group of six stars situated on the face of the Bull, Taurus Constellation. They include γ Prima Hyadum, δ Hyadum II, and ε Ain. Hyadum I, Gamma Tauri, is a magnitude 3.7 star. The traditional name Hyadum I is Latin for First Hyad, sometimes called Prima Hyadum. Hyadum II, Delta Tauri, is a magnitude 3.8 triple star. The traditional name Hyadum II is Latin for Second Hyad. Prima Hyadum is a Saturn-Mercury star in Ptolemy’s coding, which we might well describe as unhappy thoughts, and so shows up when the star is on a difficult aspect or planet in a horoscope. But if it be harmonious in aspect, instead, the same star denotes a good clear thinker, writer or speaker. 1. 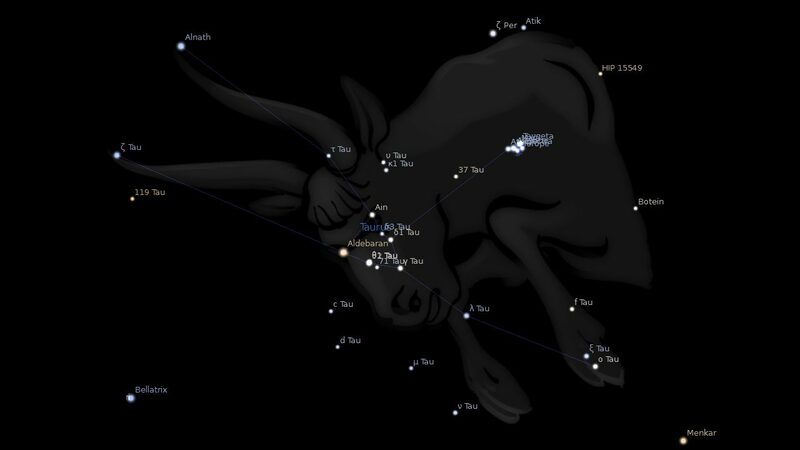 Fixed Stars and Constellations in Astrology, Vivian E. Robson, 1923, p.188. 3. Fixed Stars and Their Interpretation, Elsbeth Ebertin, 1971, p.19. 5. The Fixed Star Health and Behavior Imbalance, Ted George and Barbara Parker, 1985, p.25. WOnderful post! So accurate. I am so fascinated by fixed stars. I have so many planets and asteroids in the area. I am successful in quick healing other people sorrows, traumas etc, skilled in writing. Scar on my nose, bad eyesight although corrected by exercise. Not receiving enough love In my youth. Not gay ( aka “evil disposition”)????. Thanks Alice. I think the stars in this area with the evil disposition apply mainly to gay men. What an asinine prejudicial contention. I’m not evil, although comments like this lead me to wonder about YOU! I’ve got Jupiter conjunct this star, but like you said – if other stars/aspects have a stronger orb or more significance then they dominate. Because I would say the only truth here is ambitious and quarrels with immediate relatives, but definitely not dishonest. Jupiter’s on my ascendant. I could imagine myself being a military commander, but who knows – it may be different if I was put into the career from a young age. I’d rather be in command than shouted at in the military though. You you, from watching films like ‘Full Mental Jacket.’ I wouldn’t want to shout at people, but I do think that I would make a good leader and I’m a communicator. The commanders must enjoy shouting at people to be able to do it. It makes you wander what’s going through their heads. Very masculine, but maybe too masculine. It’s nice to have a balance in life with masculine and feminine energy whether you’re a man or woman. I like men who are in touch with their feelings and sensitive, caring and sweet. Oh I love those hind of guys. Apparently we’re attracted to whatever our Mars sign is, if woman. Venus for man. Do you reckon that’s true, Jamie? My Mars is in the constellation of Pisces and I find myself being attracted to the really sweet, slightly emotional and sensitive men who are caring. I can’t wait to meet a guy like that! Not sure about that Katie. I think the Descendant related more strongly to our inner partner. Sure Mars is your passionate desire but more just physical than the whole package with the DC. I meant that I couldn’t imagine myself being a commander. I need to start proof-reading before I tap the send button! Yeah, I know what you mean. Mars isn’t long-term (marriage). Descendant’s for the long haul. Looks like Sun quincunx Mars would have an aversion to commanding. Apart from stellar influences there are no aspects suggesting bossing people around. Moon sextile MC is public popularity so you could win a popularity content or election. Yeah, I let people do what they want, because I wouldn’t like someone telling me what to do. We should all be free to do what we want (good intentions and all). I’ll have to read about that aspect (the Sun and Mars), I haven’t read about it yet. A family friend was joking around the other day that I should go up for priminister – it’s because I’m always taking about politics to him (but we mostly have the same political views). Apparently moon opposite vertex has a public popularity effect? I have that aspect and was reading about a celebrity who has that. I can’t remember if it was Brad Pitt? Quincunx is a minor aspect but I though it would be relevant being the only aspect to your Sun. Yes that Vertex aspect most likely does even though I have not heard of it or researched it. I do remember that Part of Fortune opposite a planet seems to bring good fortune too.